Here I will explain how to display data from database in HTML Table in asp.net using c# and vb.net or show data in HTML table from database using asp.net in c# and vb.net. In previous articles I explained jQuery play youtube videos in asp.net, Access HTML selected value from dropdownlist in asp.net, Remove tab index or tab focums for HTML elements in asp.net and many articles relating to HTML, asp.net, c#,vb.net and jQuery. 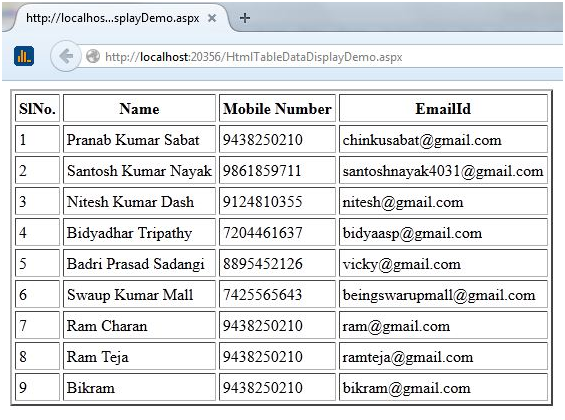 Now I will explain how to display data from database in HTML Table in asp.net using c# and vb.net. So directly using HTML table for displaying data from database is most effective rather than gridview in terms of Performance. But for some operations like sorting, searching we should prefer GridView or some other server side data controls. scmd.CommandText = "SELECT * FROM UserInfo"
Sir can u please tell how to adda dropdown list to the HTMS table and bind data from database? sir how to edit,delete records in this table and database. But problem is my table design is broken. Like right side bootstrap paging, search option etc.